Kern County is one of California’s largest counties at more than 8,000 square miles. The region has four very important job sectors—agriculture, oil, health care and logistics. And like many other California counties, it has a workforce problem—a lack of skilled workers for the jobs in those and other sectors. 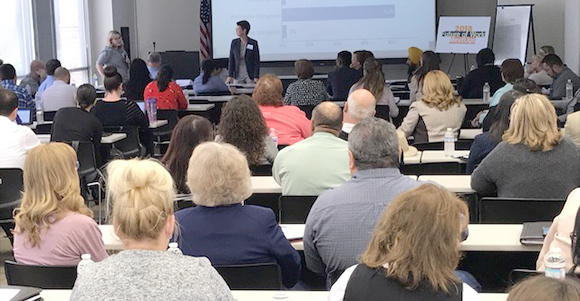 That’s why when California Community Colleges Executive Vice Chancellor Van Ton-Quinlivan visited Bakersfield this week to talk about workforce, a sizeable crowd of community and education leaders showed up. The interest can be explained in statistics. Kern County has a large number of STEM jobs available, leading many other counties in the nation for jobs in engineering, technology and science. Yet it also has the biggest problem with the number of disconnected youth — residents 16-to-24 years old who are neither in school nor working. And there are many other people who are actually working but who are being left behind because their job skills are not keeping up with the fast moving and ever-changing California economy. “These are the stranded workers in California. There are over eight million of them in California, and over 2.5 million of them are under the age of 34,” said Ton-Quinlivan. The vice chancellor was promoting Governor Brown’s proposal of a statewide online college aimed at helping these workers improve their skills by creating more flexibility that allows them to take courses when it’s convenient for them and lets them progress at their own rate. It’s part of the current proposed state budget under consideration in Sacramento. For Stacey Falgout, dean of instruction for the West Kern Adult Education Network, the idea of a statewide online college is just what the doctor ordered. "We see this stranded adult worker a lot in our area," she said. Falgout's team has created programs offering opportunities for people interested in welding, driving a forklift and becoming security guards—all middle-skills jobs available in Kern County. "We need to take the classes to the people in the communities where they live," Falgout said. "The ability to take some up skills courses online can be even more convenient." One criticism of the online college has been that these workers may not have the skills to navigate a digital college. Falgout thinks those fears are overblown and to make her point she pulled out her mobile phone. "This is a computer and everyone has one," she said. "We spend time in our programs teaching them how to use it. This is in synch with the Community College plan to aggressively "onboard" the students once the online community college is approved. 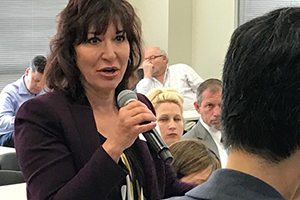 The Kern County event was the tenth of the Future of Work MeetUps series, which the Community Colleges has hosted around the state with regional partners. A major theme during this statewide conversation has been the impact automation will have on local economies. An interesting difference from previous MeetUps emerged during the Bakersfield meeting: While half the audience believes the local economy will see a noticeable disruption in the workplace from automation in the next five years, they are less apprehensive than other regions polled during the MeetUps. "We won't be immune to the impact of automation," said Richard Chapman, president and CEO of the Kern County Economic Development Corporation. But he added that the addition of a new industrial automation major at local colleges is helping address that need. "The major is critical to prepare for the coming disruption," he said. As has been the case in many other previous meetings, the MeetUps provide an opportunity for local leaders to provide feedback and talk about the workforce issues and the future of their region, a theme emphasized by the Kern County Superintendent of Schools. "This is an important even to our voice heard in Sacramento on this important issue of the future of work," said Dr. Mary Barlow. Four more MeetUps—in the Inland Empire, Los Angeles County, Orange County and Fresno—are planned in the next month. Get more information at the Future of Work MeetUp site.